Thursday, Nov. 19, 9 p.m.
Adara Rae Lialios may be be just 20. And Here Comes The Music may be her debut record. But the 12-song album has been in the works for a long, long time. A born singer and natural performer, Lialios can trace her love of the stage to early childhood, her songwriting prowess to elementary school and her buzz around Tucson to just after high school. A steady band at her side, the project is now Adara Rae & The Homewreckers and the brand new album sounds more like the work of a veteran than a newcomer. "I've always been a little on the dramatic side," Lialios says. "Now I feel like I'm catching up with the old soul that I have." That fact is as clear in person as it is on record. In conversation, Lialios covers songwriting, recording, putting together a band and the longtime influences that helped shape her musical voice ("I am the biggest Morrissey fan you'll ever meet," she says. "I give some credit to George Michael too."). The release show for Here Comes The Music kicks off a 10-day tour that spans Arizona, California and Nevada. She pegs her performing genesis to when she she was about 4 years old, and Lialios went to watch the talent show at the elementary school where her aunt worked. At the end, they invited anyone else up who wanted to perform and she sang the first two lines of "Tomorrow" from Annie. Just two lines, over and over, because that's all she knew. "From that first moment, I knew I wanted to be a performer and be on stage. But it took some trial and error to figure out what form that would take," she says. From there, she participated in musical theater and choir, and when she was 9, she got her own guitar. It wasn't long before she started writing her own songs, nor did she stay singing to just the walls in her bedroom for long. "I always loved to write and sing and I'd always shared songs I'd written with close friends and family, but I started sharing more and more when my friends started telling me they could relate to the songs," she says. "To be a singer-songwriter takes a certain amount of craziness and blind ego in the first place, to say that 'I have something to say to people.'" Lialios wrote some songs on her debut in just the last few months before she started recording, while others go clear back to when she was 13. "I'd had this pile of songs I'd written for the walls of my bedroom, basically. But just because they're old doesn't mean they're not new to someone else," she says. 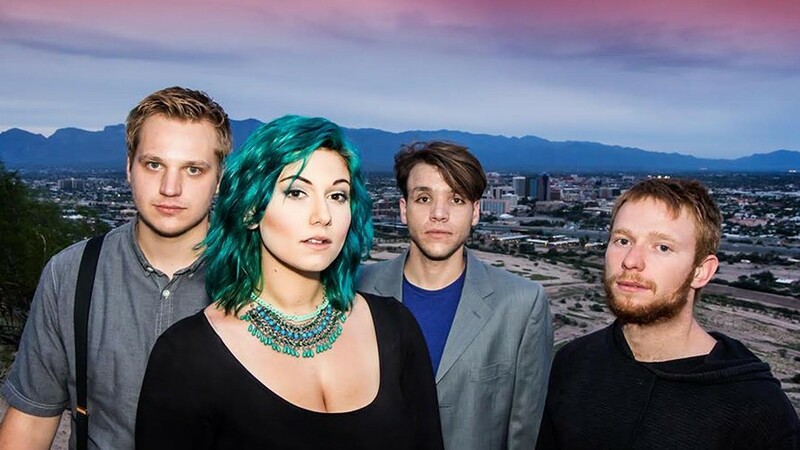 Lialios began performing from her pile of songs at venues around Tucson as Adara Rae toward the end of 2013, shortly after graduating high school. And though the reception was positive, Lialios knew she needed a full band to make a bigger impact. "For a little while, people dubbed me as country because it was just me and an acoustic guitar, but even then I wasn't listening to country," she says. "Having a band and a fuller sound and just being closer to rock 'n' roll definitely opens up the level of performance you can put into a show. I can dance around as just me and an acoustic guitar, but after a while it'll look a little silly." The first of her current lineup to come onboard was multi-instrumentalist Seth Murzyn, who became a Homewrecker after his previous band had opened for Lialios. His roommate Casey Hadland was a drummer and became a natural addition, while bassist David Velasco had simply started out as a fan before joining the band. "I've had a lot of Homewreckers," Lialios says. "I was 18 when I started and didn't know the scene, so whoever wanted to play with me would play with me. It was after the album was recorded and when I knew I wanted to tour that I knew I had to get people who were willing to give their lives to me." The Here Comes The Music title comes from Lialios' insistence that there's no reason to reduce her music to just a single description. "People always ask what genre it is, but if you see a live show, you'll see bits of country, bits of rock, bits of pop. It's all just music," she says. "With the whole campaign around this album, it's been really important to get across the fact that it's just music." The versatility of her band helps get that point across. On any given song, Murzyn might pick up a viola or a saxophone or a guitar or move over to the keyboard. Lialios recorded Here Comes The Music over about two years, starting before Adara Rae & The Homewreckers were even a thing and working in several studios in several places. Her manager, Tommy Rat, had previously been the tour manager of MxPx and got free time at the band's studio in Bremerton, Wash.
"We called in as many favors as we could," she says. "There are a lot of different players on the record and a lot of ideas, but my voice and my songwriting creates the continuity." Contributing to the album are big names like Good Charlotte drummer Chris Wilson ("He's someone I had on my wall on a poster as a kid, so there was nervousness, but he really shaped those songs," Lialos says) and frontman Mike Herrera of MxPx (her first concert). "I always knew Tommy, my manager, had worked with them. I kind of made a joke about doing a duet with Mike, and the next day, Tommy said Mike was into it," she says. "When I heard it, I cried." The album ends with a song recorded live—a purposeful choice made to bring the Adara Rae musical story right up to the present. For the release show, Lialios invited Amy Mendoza (her first bass player) and Sock!Fight (featuring one-time Homewreckers Uma Desilva on keyboards and Daphna Ron on drums) as openers. "It's bringing it back to how it all started, while also taking it to the next level," she says.